Share the post "Cool Gardening Projects To Do With Kids"
There is a natural attraction between kids and the earth, whether it’s making mud or discovering a germinating seed emerge from the ground. Children are curious, like to learn by doing, and love to play in the dirt. Gardening is a great way to let a child experience the satisfaction that comes from caring for something over time, while observing the cycle of life firsthand, teach environmental awareness by exploring the workings of nature. It is very important to open new windows for your child in our world dominated by technology. Children learn better when they understand the context of their activity. They will learn that gardening can be fun, but far more than idle play – they are contributing to the family well-being. Start small, and build on success. The kids will be fascinated. Take an old pumpkin and cut the top off it. 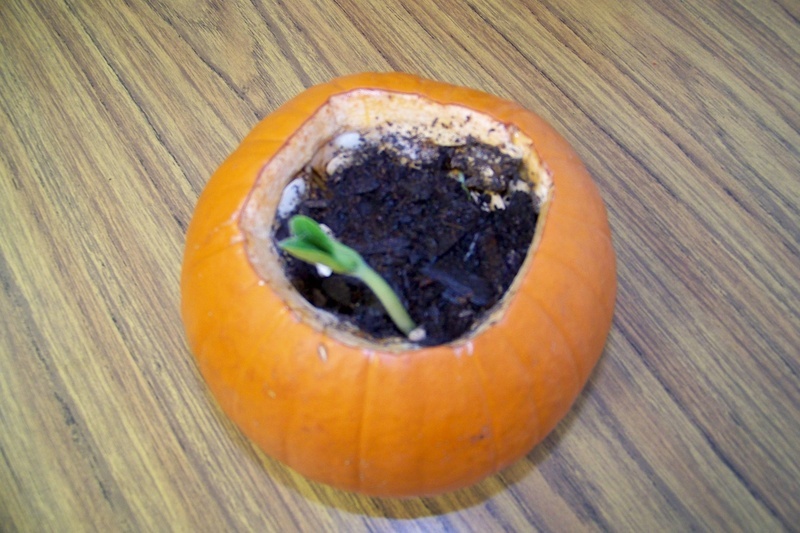 Leave seeds and everything inside the pumpkin as it is and add a little bit of soil and water. That’s it. In about a week or so watch the seeds, which are already inside the pumpkin grow. When your pumpkin will start exploding with sprouts, plant it in the garden. This little experiment demonstrates the circle of life, how the new growth comes from the old and is nourished by the old. 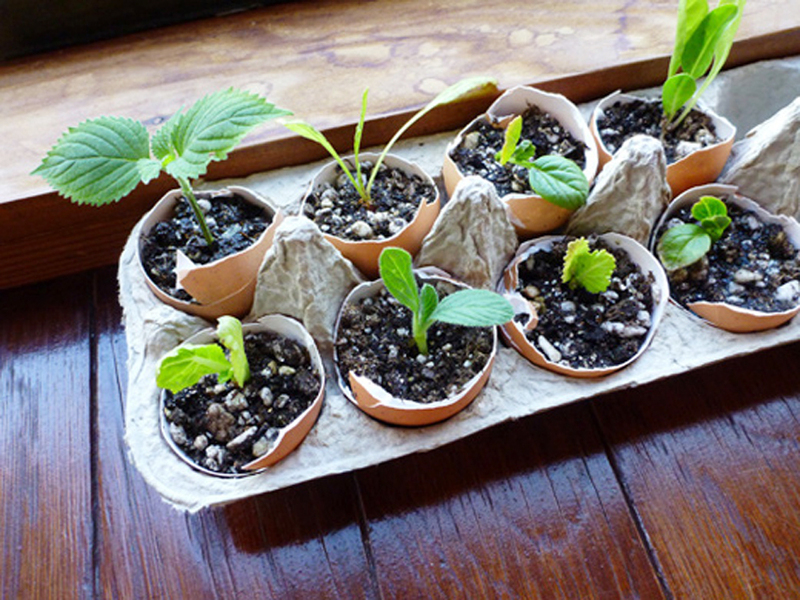 Sprout your garden in a really cool, organic and cheap way – use eggshells! The entire eggshell starter pot is biodegradable, so after your seeds sprout you can plant them together with the eggshells in your garden, just squeeze each eggshell gently until it crushes before planting as the seedling roots need to easily find their way to the fresh soil. First, you need to make a small drainage hole in the bottom center of each egg. Use a pin or a thumbtack. The hole should be large enough not to get clogged by soil. Secondly, carefully remove the top of the eggshell (about 1/3). You can use a small sharp knife. Now, you need to empty the shell – shake the raw egg out of the shell into a bowl. Use the eggs as you wish, scrambled eggs or an omelet sounds yummy! Next step is to wash the eggshells and boil them for about three – four minutes in a pot to kill any bacteria. Make sure eggshells are clean inside and let them dry. Place each eggshell in a cardboard egg carton (or anything for support). You can write on each shell the type of plant seeded. Use non-toxic crayons . Get the soil and fill two thirds of each eggshell with it. Put a seed into the soil and place eggshell seed starters in a warm and sunny location. Keep the soil moist and watch your seedlings grow! Green onion or scallions are rich with vitamin C and are very good for your health. You can add fresh green onions to a variety of homemade recipes, for example, salads and soups. Take a big 5 or 6 L plastic bottle and cut off its top. Take scissors and punch holes in it, for the onion sprouts to find their way through the holes (you can make the holes bigger than you see on the photo above). Start putting layers of soil and onion bulbs, making sure the onion sprouts are positioned the right way towards the holes in a bottle. Add layers of soil and onions until the bottle is full. Set more onion bulbs on top. Water the soil and set it on your windowsill. That’s it! Now just wait for the tasty green onion stalks! 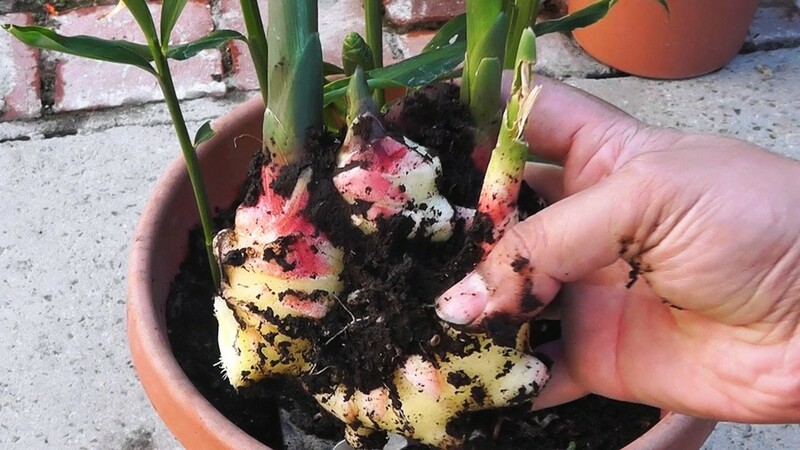 Get tulip bulbs in a local nursery. Find a tall glass vase. Add some clear marbles or pebbles to fill about a fourth of the vase. Add the tulip bulb (pointed end up) on top of the marbles. 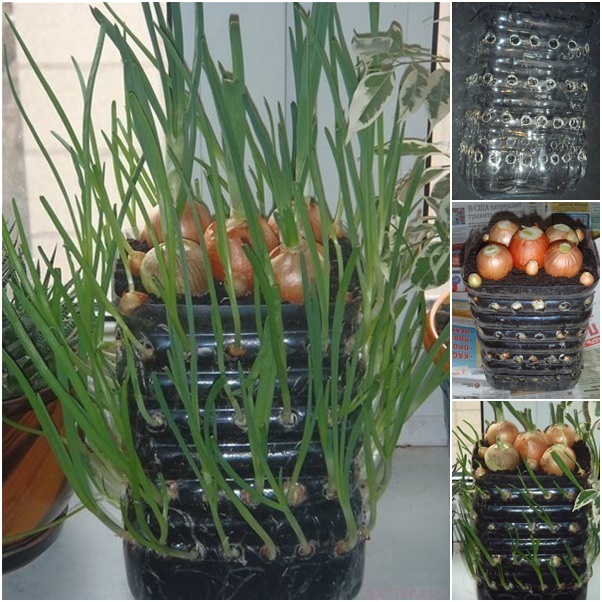 Cover the bulb with a few more marbles or pebbles to help give the growing root support. 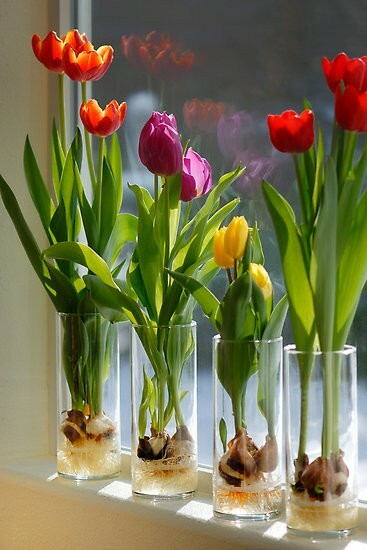 Add fresh water into the vase. The water shouldn’t touch the bulb, but it should be very close, so that the roots will grow in. Set the vase in a warm and sunny location. Add some colors to your room! You can plant lemon seeds in a jar, or a pot, or even a cup. Lemon leaves smell very good. 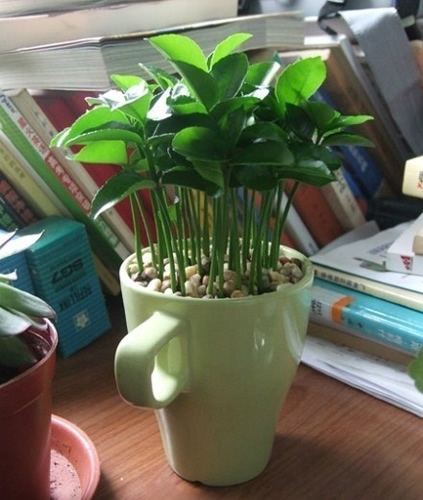 Green lemon seedlings will provide a very nice lemon scent for any room you place it. It is a great natural air freshener and is 100% chemical free! So, take an organic lemon and get the seeds out. Wash the seeds and soak them in water for several hours. Pat them dry on paper towels and then carefully peel the outer shell. Prepare a potting soil in a flower pot or a cup and plant the seeds in a circle working from the center approx. half an inch deep. Add water to moisten the soil (do not overwater). Cover the soil with small pebbles and place the pot in a warm location which gets some sunlight. (You can also cover the top of the pot with the plastic wrap to reduce evaporation and set it in a warm place. When you see the lemon seeds sprouting remove the wrap.) Don’t forget to water seedlings once a day to keep the soil moist. Make sure your plant gets some sunlight too. Enjoy the smell of baby lemon plants! Later you can transfer them to bigger pots or into your garden. Did you know that historically, people sprouted sweet potatoes and used them as houseplants? You can also eat the tender shoots and leaves that emerge from the potato and they are delicious with a slightly spicy flavor. In addition, they are very nutritious. Sweet potato vines are probably the fastest growing and it is lots of fun. The vines will have purplish green colored leaves that are very attractive. So, let’s begin! Get an organic sweet potato (to make sure it hasn’t been sprayed with a sprout retardant), firm and without any bad spots. Get a glass, a jar or any small container and fill it with lukewarm water. Insert three or four toothpicks into the sweet potato halfway, starting about 2 – 3 inches from its bottom. Set your sweet potato in the prepared container with water so that the tip is submerged and place it on a warm, sunny windowsill. You can also cut one potato in half and place them in two different shallow containers with water, with the cut portion of the potato resting in water and the upper half exposed to the air. Keep the water clean, replace it with fresh water every 2 to 3 days. Don’t use softened water, as it is too high in salts for all houseplants. 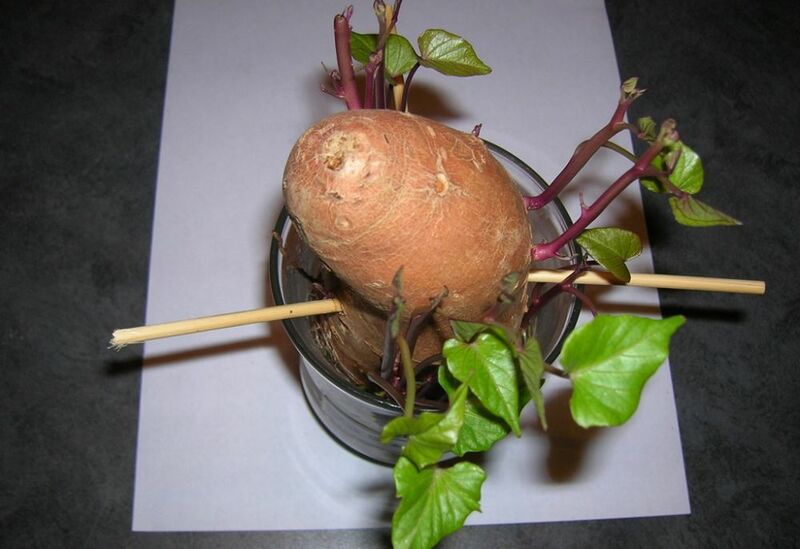 When your sweet potato sprouts, the vines grow quickly, so prepare to support them with staking. Useful info: There are two different types of sweet potatoes: ornamental sweet potato vines and sweet potatoes for eating. Ornamental sweet potato vines are sold at nurseries as annuals for the gardens and containers. Though they are from the same plant family, ornamental sweet potatoes, have been bred to maximize the beauty and color of the leaves as well as the size and shape of the plant. Ornamental sweet potato vines can also grow edible tubers, but they are not tasty and can be very bitter. 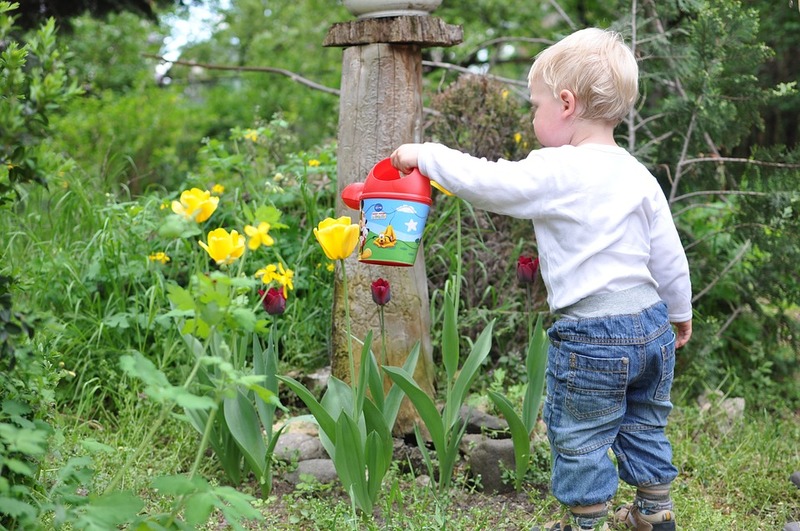 Have you got more ideas for the gardening projects with kids? Share in the comments below this article!